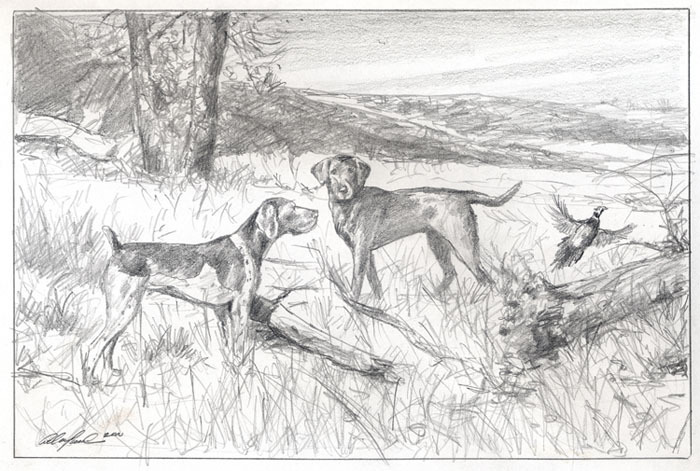 In early November I went to Colorado on the request of a client who wanted a painting of his beautiful hunting dogs. As I started working on this project, Leslie Parke, a dear friend, fantastic artist and one of the driving forces behind our Washington County Open Studio Tour suggested I might write about the process involved in painting a commission from first concept to final oil. It is a wonderful idea, so I will start from the beginning explaining over the next month or so how the initial artistic vision is transformed into a finished painting. I met Mel, my client, through his sister-in-law Sue, when he and his wife Meg, were visiting from Colorado. Sue lived one street over from me for 18 years when we lived in New Rochelle, (NY) but I only met her a year ago when she moved to upstate New York a few miles from Cambridge, where I now live. I met Sue when she came on board to help our group develop the Open Studio Tour of Washington County. She has been a tremendous force in developing the Tour. So last Spring, Sue called to ask if I’d be interested in taking Mel fishing on the Battenkill when he came to visit during the summer. I sure don’t need any excuse to go fishing so I immediately said yes. July rolled around and I finally got to meet Mel and we hit it off wonderfully. He is witty, incredibly bright and a ball of energy. He is passionate about the outdoors and I enjoyed hearing his stories of Montana where he lived and worked for a few years. Bright and early one morning in July, we headed off to the Battenkill to fish. Unfortunately the weather gods were up to no good. We had been dealing with a tremendously hot summer here in the Northeast with little or no rain that led to low water conditions. As a result, fishing that day turned out to be tough but we managed to catch a few fish anyway. Before Mel and Meg were to head back West, they came by to see my studio and take a look at my paintings. 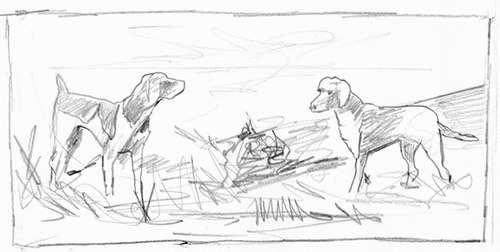 Mel asked me if I might be interested in painting an oil of his hunting dogs. The opportunity to paint exquisite dogs is always a challenge and a treat. We briefly discussed a few possible ideas and I told Mel I’d send him material to look at and we left it at that. A month later Mel confirmed that he wanted me to go visit him and spend a day hunting at the club he was a member of. I arranged to fly to Denver the first week of November. I was concerned that I would find snow and cold weather in Denver, but to my surprise, for 5 days, it was in the mid 70’s and sunny. This time the weather gods were on our side! Early the following morning we headed to the hunting club along with Richard, a friend of Mel who was visiting from Seattle. 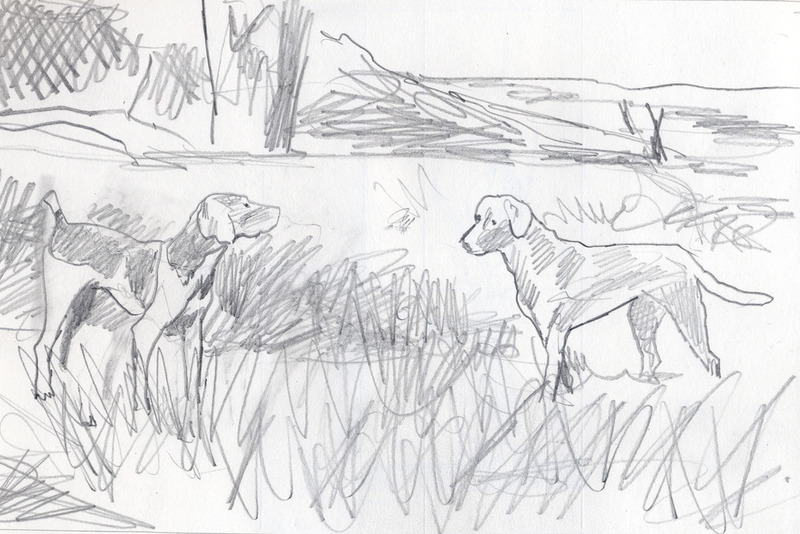 Anxious to get to work, were Bella, a Black Lab, and Nella, a Short Haired German Pointer. We spent about 3 hours walking some interesting terrain full of pheasant and Hungarian partridge. The dogs worked beautifully and flushed plenty of birds. Unfortunately the heat and strong sun took its toll and by 11:30 we were all ready for a lunch break. 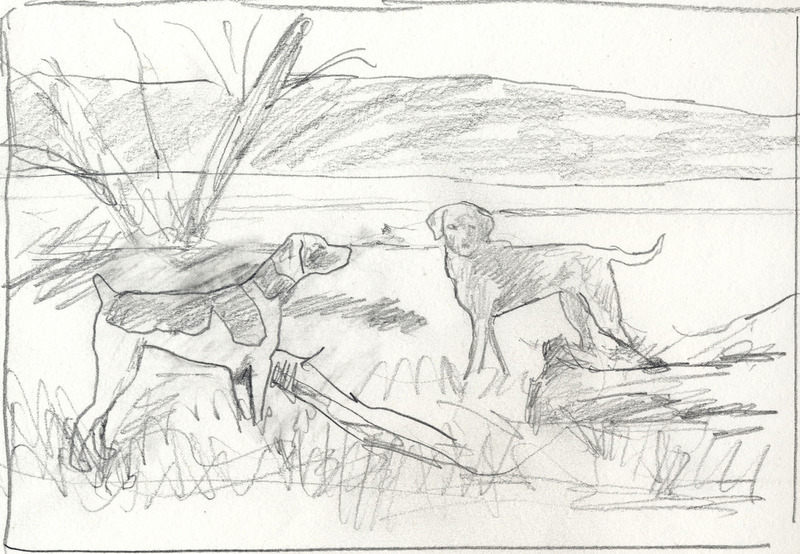 Later that afternoon Mel took me to visit Bella and Nella’s trainer at a beautiful preserve 20 minutes from the club. 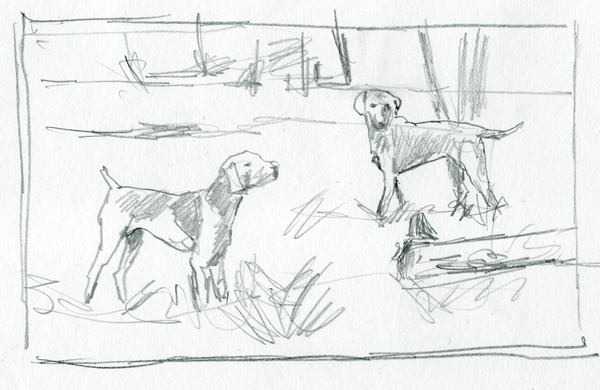 We spent an hour posing the dogs and I was able to gather plenty of reference shots and really study the dogs and their characteristics. When I had first spoken to Mel about my trip, he had strongly suggested that I add an extra day for something he knew I’d enjoy. I eventually found out he had booked me for a day of fly-fishing on a private stretch of a tributary of the Platt River. Needless to say I was excited for the opportunity to spend a day chasing big Colorado rainbows. So early Sunday morning, the day before I was to head home, I drove west from Denver to Pine Junction where I met Jack Moreno a local fishing and hunting guide. Jack is a simpaticone who is incredibly passionate about his hunting and fishing. We spent 7 hours catching (and releasing!) gorgeous rainbows on a beautiful small river. The day was a wonderful end to a great trip. I sent them to Mel to look at. 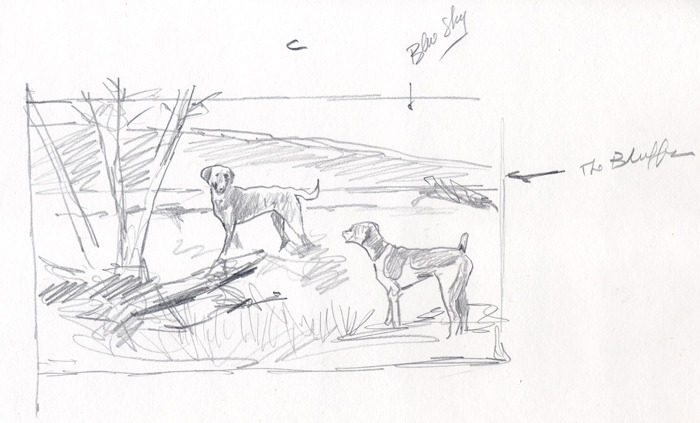 We agreed that B would be the most interesting so I continued to work on the composition by moving the dogs closer. and sent it along to Mel to look at. 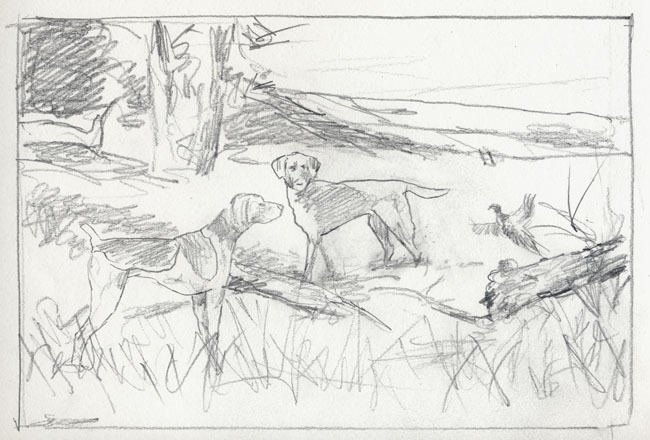 In the final sketch I decided to add in the background some of the Bluffs that are characteristic of the property where Mel hunts. I also enlarged the pheasant and moved it slightly higher. All these were minor changes, which made the final composition more pleasing. Once approved by Mel, I would create a small oil study to show my client so as to give him a better idea of what the final painting would look like in color. Promptly, Mel enthusiastic answer came back with some other minor suggestions and the go ahead to complete the next step. On my next posting I will show the oil study results and continue explaining the commission process. 2 Responses to "The Anatomy of a Commission"